Your main Christmas tree doesn’t have to be the only tree in your Christmas decor! It can be fun to include trees of other shapes and sizes elsewhere in your house. Even if you don’t have space for another full 3D Christmas tree, you can still make a tree that fits. 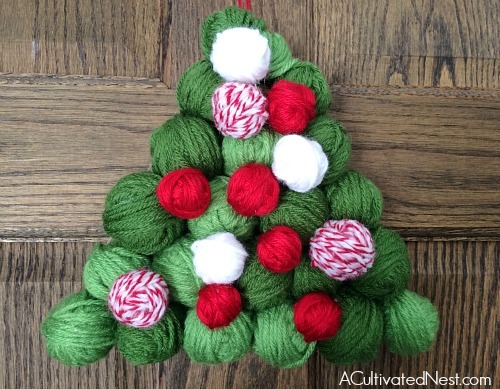 This DIY Christmas Yarn Tree would fit easily on any blank wall you have available, or even on an interior door! I chose to use green, white, and red as the colors for my tree. But if you want, you don’t have to stick with traditional Christmas tree colors. 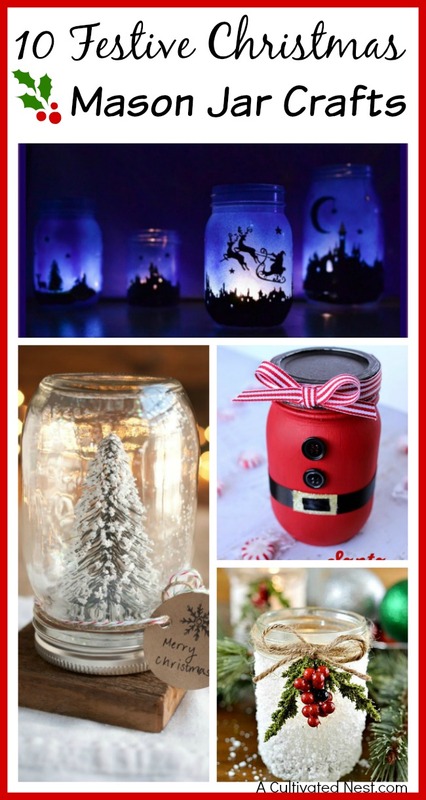 You can choose whatever colors that fit in with your Christmas decor! 1. Cut a large triangle out of cardboard (12″ on the sides and 10″ on the bottom). 2. 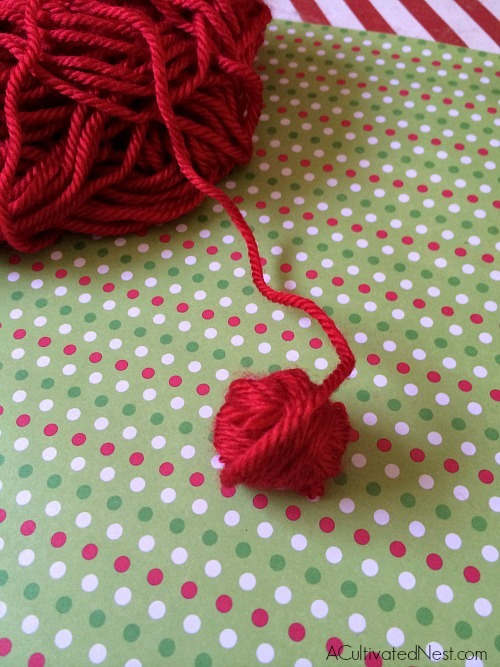 Begin making yarn balls by wrapping your yarn 8 times on 3-4 of your fingers. 3. 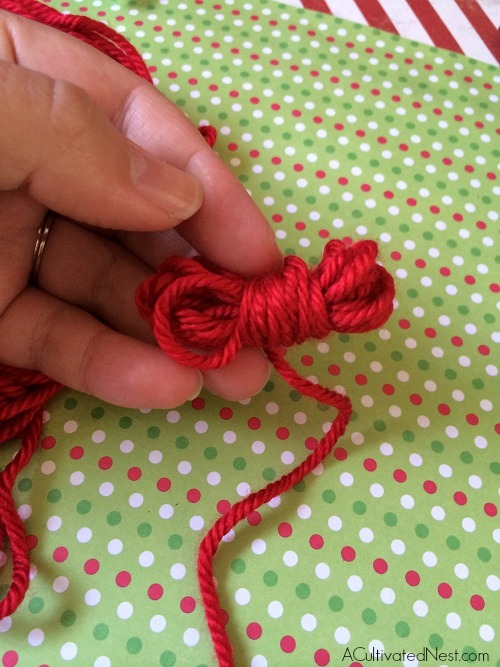 Slide the yarn off your fingers and wrap the yarn around the center about 8 times. 4. 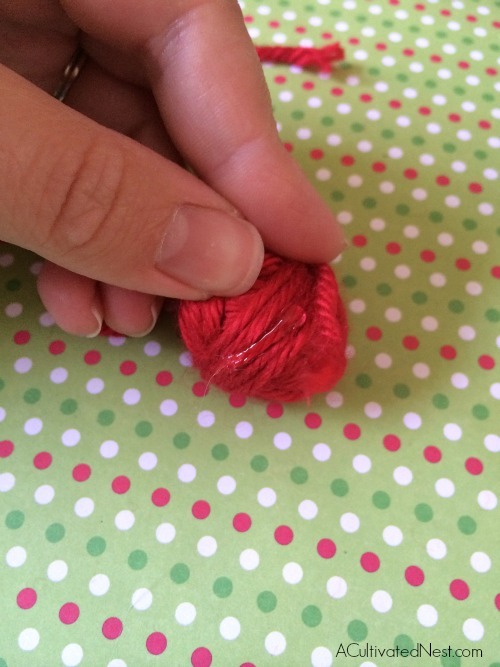 Fold that in half, and wrap around the center 4 or so times. 5. Turn the opposite way and wrap around another 4 or so times. 6. Repeat steps 4 & 5 until you reach the size ball you need. 7. 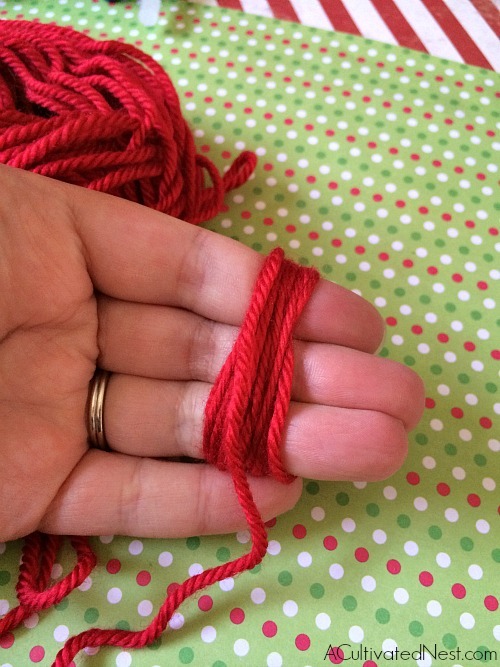 Cut the end of the yarn. Hot glue the end to the yarn ball. 8. Repeat steps 2-7 around 25 times for your green balls, 6 times for your smaller red balls, 3 times for your smaller white balls, and 3 times for your red/white balls. 9. Begin gluing the green balls onto the cardboard, staring at the bottom. 10. 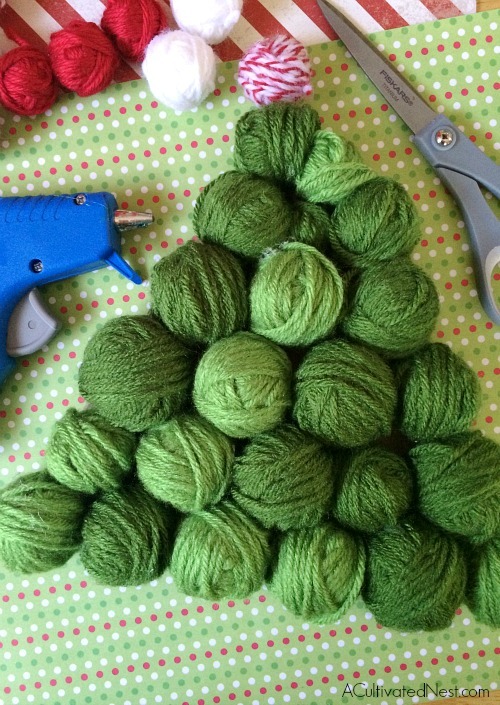 Once all your green balls are glued on, start gluing on your yarn ball ornaments. 12. 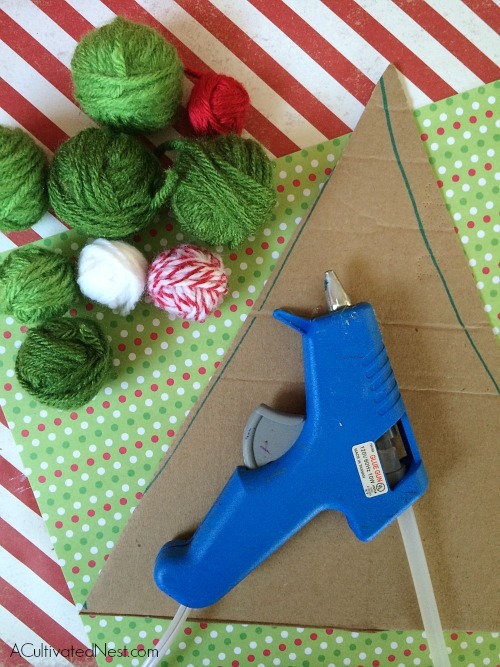 Once all your ornaments are on your tree, turn your tree over and glue your yarn on to hang the tree, then glue felt over the yarn to endure a hold. 13. Your tree is ready for you to hang and welcome in the Christmas season! Well, now isn’t that the cutest little yarn creation:) Have a blessed day and Thanksgiving that is perfect! HUGS! So cute, and so easy too! Great idea! I love this idea! What a great way to use up some leftover yarn. Of course I will have to go buy the green yarn since I never crochet or knit anything with green! Thanks for sharing this project – pinned. I just love this idea! I have a bunch of green yarn leftover from a recent project, and now I know what to do with it. Thanks for sharing this wonderful idea!! What a simple and adorable idea this is! This yarn tree is adorable! How very clever! I’d love for you to share it at my Creative Ways Link Party when you get a chance. Have a great week! This is SO adorable! Thank you for sharing at Merry Monday!